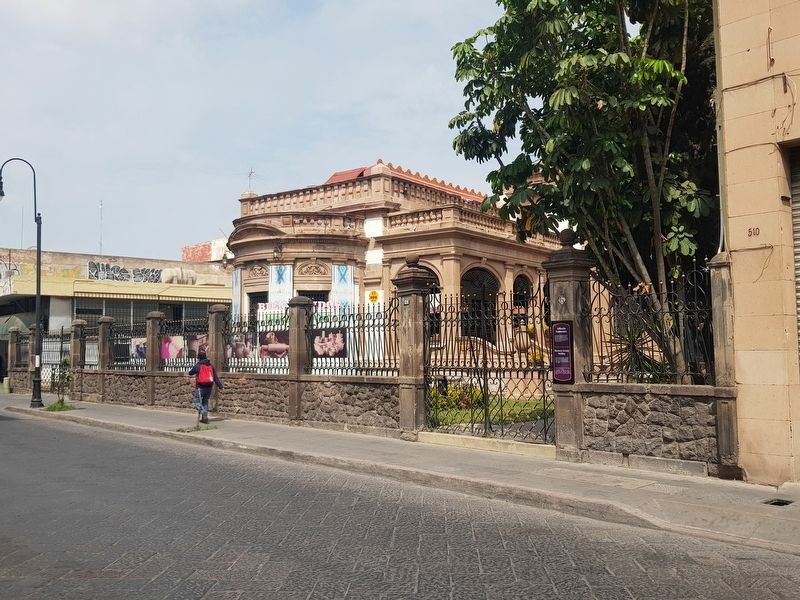 Es una muestra típica de las casas potosinas de la época del porfiriato, que se caracterizaron por tener el nivel de piso interior elevado con respecto al nivel de la calle para dar cabida al sótano; esta señorial residencia contó con un denso jardín en la parte frontal y ha servido como escenario para varias filmaciones y algunas películas proyectadas en cine. En uno de los muros se encuentra labrado el año de su construcción que data de 1896. It represents a typical Potosí house from Porfirio Diáz's times. One of its most important features is its inner level floor, set higher than the street's level, leaving space for a basement. This elegant residence used to have a dense garden on its front yard, and has served as setting for several movies and films. 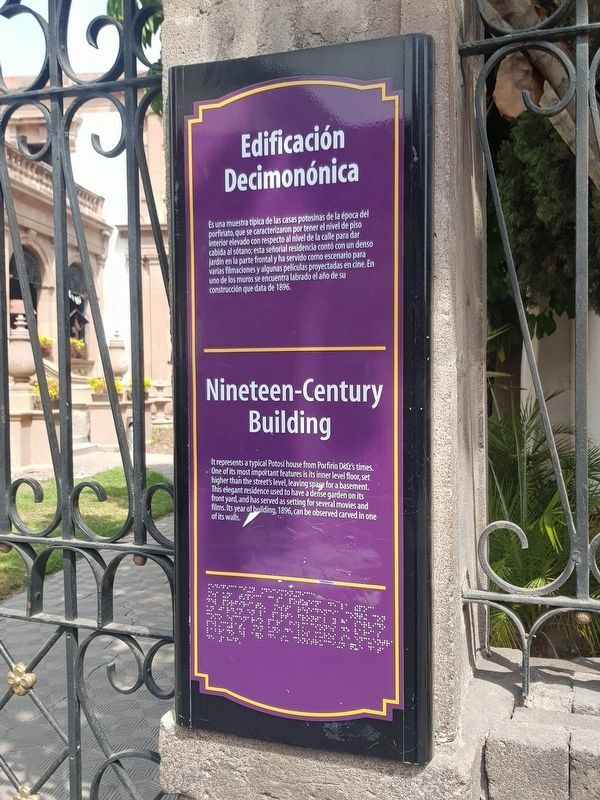 Its year of building, 1896, can be observed carved in one of its walls.
. Marker is on Álvaro Obregón just west of Damián Carmona, on the right when traveling west. Touch for map. 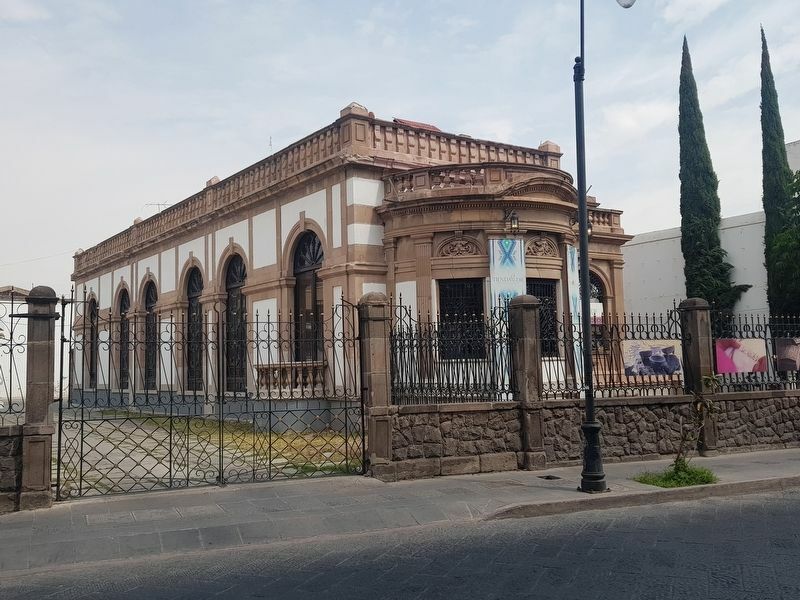 Marker is in this post office area: San Luis Potosí 78000, Mexico. Touch for directions. Other nearby markers. At least 8 other markers are within walking distance of this marker. Loreto Chapel / Jesuit Temple / Former Jesuit Convent and School (within shouting distance of this marker); Capitán Miguel Caldera (about 120 meters away, measured in a direct line); Founders Square (about 120 meters away); Former Othón Theater (about 180 meters away); The Plan of San Luis (about 210 meters away); Government Palace (about 240 meters away); Government Palace / Vicereine’s House (about 240 meters away); The House of the Vicereine (approx. 0.2 kilometers away). Touch for a list and map of all markers in San Luis Potosí. More. Search the internet for Nineteenth Century Building. Credits. This page was last revised on April 16, 2019. This page originally submitted on April 16, 2019, by J. Makali Bruton of Querétaro, Mexico. This page has been viewed 19 times since then. Photos: 1, 2, 3. submitted on April 16, 2019, by J. Makali Bruton of Querétaro, Mexico.